Country living at it’s best! Located approximately 13 minutes south of Fredericksburg this two suite property is located next to the homeowner, but is private, comfy and cozy. There are two suites—the lower suite and the upper suite, which has two levels. Taking the stairs to the right of the house will take you to the “Upper Suite”. The deck outside is great for relaxing and enjoying the many crisp cool days we all enjoy in the Hill Country. A table for six and chiminea are available to you during your stay. Inside you will immediately be enchanted with the French Country décor and comfortable seating and amenities! A large leather sofa and comfy chair are placed to enjoy the flat screen television and gas log fireplace. A half bath is also found downstairs. 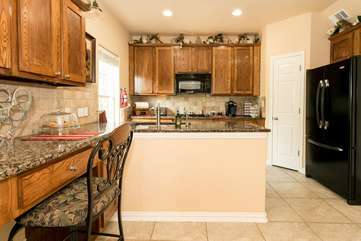 The awesome kitchen is arranged for gourmet cooking with it’s granite countertops, gas stove, electric oven, microwave, large refrigerator, Keurig coffeemaker. There is a bar height table for two conveniently located between the living room and kitchen. Upstairs is designed for romance. If you are celebrating that special occasion, we invite you to experience this special room. A queen bed is in the bedroom along with a comfy chair. The adjacent bathroom has a large inviting whirlpool tub plus a large glass shower. Two vanities and sinks are found on both sides of the whirlpool tub. We loved staying at the Elizabeth’s Haus. It had everything we needed. The bed was comfortable and I loved the master bathroom. We will be renting the entire house next time. Hands down, my favorite house. This home exceeded our expectations. It was everything and more than we could hope for. It's very quiet and secluded for that perfect romantic getaway. I would highly recommend and definitely book again! Such a blessing in many ways. This condo was perfect for a girls weekend get away. It’s the perfect distance from town and it was so peaceful. The Upper Suite warmly welcomed us upon arrival. Home was one of the cleanest homes I have ever stayed it. It truly is a home away from home. Enjoyed the snacks that were left from our lovely hosts and loved the twist of have simple breakfast breakfast items available. The home is placed in a very beautiful spot in the Hill Country, with aspects of nature all around. The one thing I would recommend is placing window drawers in the bedroom. The morning sunlight came through very early, so not conducive if you are looking to sleep in. We have stayed at the Elizabeth House Upper Suite several times. It's an elegant and spacious retreat that is away from the crowds yet close enough to shop and spend time in Fredericksburg. We love the privacy as we sit out on the upstairs deck under the trees. Peaceful location wirh easy access to town. The location is up to date and very well decorated. The property was just perfect! Just what we needed for a busy weekend of looking at wedding venues for our daughter. Couldn’t have asked for better hosts!